End the night on a high. The Singapore Grand Prix weekend is going to be an exciting one! After all the fun, glamour and fast cars, don’t let the road closures and traffic spoil the night. Here are some tips on how you could navigate the fast paced night with ease. Forget about flagging a cab. Book a GrabCar or GrabTaxi ride and sashay away to the pick up location to a car waiting for you to board. While you would expect higher fares this weekend, upfront fares give you the option to book a GrabCar ride only if you’re comfortable with the price. In the commotion of people leaving all at once, be aware of your surroundings and know where to go to get a Grab ride. We’ve put together a map and a list of some GrabTaxi and GrabCar pick up points that are nearest to each F1 gate. Use this to your advantage! Book a ride on race day with these simple steps. Key in your Pick-up point and select from several of the above locations. Then, key in your Drop-off point. Select the service you prefer. Check the price of the ride and tap on Book. Grab a ride home for a worry-free weekend. See you on race day! Would I be able to get Grab to pick me up from where ever I want if it isn’t one of these listed places? Due to the crowd, possible traffic congestion and the commotion, we’ve sieved out these locations to help you navigate to your next destination with ease. It will be best to follow these guides, however, if necessary, you may also contact your driver to pick you up elsewhere. What if I can’t get a ride? We expect a high volume of bookings, so please book in advance if possible. We seek your patience to keep trying as our drivers will do their best to quickly get you to your next destination. Can I set my pick up point at a taxi stand if I have booked a GrabCar? Please refrain from setting your pick up point at a taxi stand if you’re making a booking with GrabCar. 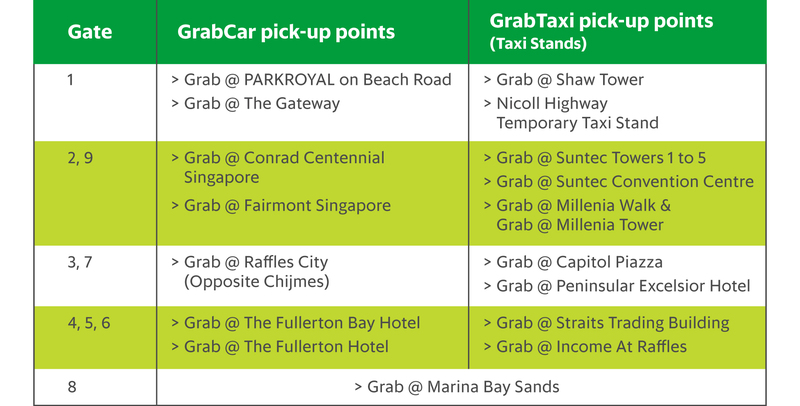 Do refer to the table above for the designated GrabCar pick up points. Is there a promo code that I need to or can use? No, there is no promo code needed. Simply key in the pickup and drop off locations, choose your desired vehicle and payment type and off you go! Is there an additional fee that I have to pay if I book from these Grab points? Nope, everything is as per normal. If you’re booking a GrabTaxi, you will have to pay the metered fare along with the surcharges (e.g ERP). If you’re booking with GrabCar, you’d have to pay the displayed fixed fare along with the surcharges (e.g additional stops and ERP).